.....FOR LACK OF FUNDS The campaign of the NDC Presidential Candidate, Prof. Mills, is gradually grinding to a halt due to acute lack of funds to oil the machine. Credible sources within the Party revealed that even though the TV radio and print adverts were still running, these had already been pre-paid for, thanks to the kindness of ex-security Capt. 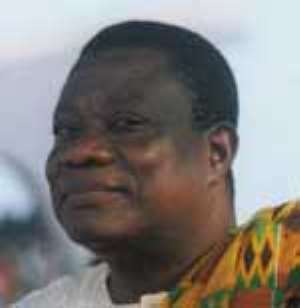 Kojo Tsikata. Their main problem is funds and logistics for the day to day running of the campaign, and these are simply not forthcoming despite promises made by NDC financiers. This situation has come about as a result of some prominent individuals in the Party promising all sums of moneys to support the campaign but refusing to honour their promise at the last hours for fear of the Party losing this year's general election.